Rabbi Marc Schneier, the eighteenth generation of a distinguished rabbinical dynasty, grew up deeply suspicious of Muslims, believing them all to be anti-Semitic. Imam Shamsi Ali, who grew up in a small Indonesian village and studied in Pakistan and Saudi Arabia, believed that all Jews wanted to destroy Muslims. Coming from positions of mutual mistrust, it seems unthinkable that these orthodox religious leaders would ever see eye to eye. Yet in the aftermath of 9/11, amid increasing acrimony between Jews and Muslims, the two men overcame their prejudices and bonded over a shared belief in the importance of opening up a dialogue and finding mutual respect. In doing so, they became not only friends but also defenders of each other’s religion, denouncing the twin threats of anti-Semitism and Islamophobia and promoting interfaith cooperation. 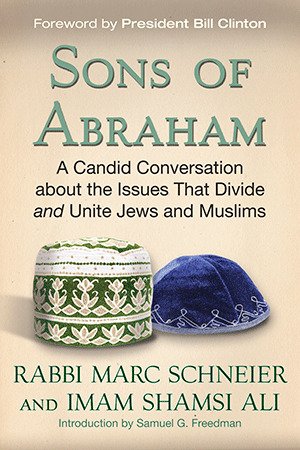 In Sons of Abraham, Rabbi Schneier and Imam Ali tell the story of how they became friends and offer a candid look at the contentious theological and political issues that frequently divide Jews and Muslims, clarifying erroneous ideas that extremists in each religion use to justify harmful behavior. Rabbi Schneier dispels misconceptions about chosenness in Judaism, while Imam Ali explains the truth behind concepts like jihad and Shari’a. And on the Israeli-Palestinian conflict, the two speak forthrightly on the importance of having a civil discussion and the urgency of reaching a peaceful solution. As Rabbi Schneier and Imam Ali show, by reaching a fuller understanding of one another’s faith traditions, Jews and Muslims can realize that they are actually more united than divided in their core beliefs. Both traditions promote kindness, service, and responsibility for the less fortunate—and both religions call on their members to extend compassion to those outside the faith. In this sorely needed book, Rabbi Schneier and Imam Ali challenge Jews and Muslims to step out of their comfort zones, find common ground in their shared Abrahamic traditions, and stand together and fight for a better world for all. The end of the Cold War laid bare, and in some cases rekindled, long-existing conflicts rooted in racial, ethnic, and religious differences. At the heart of many of these conflicts, from the Balkans to Russia to China to Indonesia to Africa and most recently in Myanmar, is religious identity. Sometimes they involve persecuted minorities. Sometimes the involve fighting within a religion, as when Sunni fight Shia. Sometimes they involve terrorism and false claims that the killing of innocent civilians, even others of the same religion, is sanctioned by God or a prophet. Of course, the conflict with the most profound consequences beyond its borders is the long dispute between Jewish Israelis and Muslim Palestinians and their Arab supporters. It echoes across the world. It is at the root of how Jews and Muslims understand and misunderstand each other in the United States. As president, I worked for a just and lasting peace in the Middle East to create a Palestinian state in the West Bank and Gaza, used the power of the United States to stop the oppression and slaughter of Muslims in Bosnia and Kosovo, and engaged in regular consultations with Muslim Americans on a wide range of issues. I also worked hard to prevent terrorist attacks on the United States and other nations. Many attacks were thwarted, both before and after I left office, but not at our embassies in Kenya and Tanzania in 1998, or the USS Cole in Yemen in 2000. After 9/11, the wars in Iraq and Afghanistan, and dozens of terrorist acts across the world—most recently the Boston Marathon bombings—it is tempting to say this is an unsolvable conflict, a clash of civilizations that cannot be defused. Of course, this overlooks the fact that the vast majority of Muslims in the United States and elsewhere are law-abiding, peace-loving, hard-working people who want to live in harmony with both their neighbors and their faith. The situation is not hopeless. For the last several years, my daughter, Chelsea, has served as cochair of the advisory board for the Of Many Institute, the largest interfaith student group in the United States, at New York University. Led by Rabbi Yehuda Sarna and Imam Khalid Latif, these students live, talk, and do service projects together. NYU also offers a minor in interfaith leadership. Still, there are too few people committed to reconciliation through honest dialogue. That’s why the efforts of Rabbi Marc Schneier and Imam Shamsi Ali to bring Jews and Muslims together, not only in the United States but also in Europe and the Middle East, are so important. Like true friends, they honestly face issues that divide Jews and Muslims, as well as what unites them as “sons of Abraham.” They not only talk the talk, they walk the walk. And their personal friendship is a poignant example of what is possible among people of deep faith and goodwill. I have been inspired by their example, and I hope you will be, too, as you read this important book. On the weekend before Thanksgiving 2012, in principle a time to celebrate fellowship, the news of Muslim and Jewish interaction was a depressingly familiar tale of bloodshed and wrath. Israel and Hamas were in the midst of an eight-day confrontation that would ultimately claim nearly one hundred sixty lives. Israel had assassinated a terrorist leader in Gaza several days earlier, Hamas had responded by launching lethal rockets into the civilian areas of Israeli cities, and Israel’s retaliatory bombing had killed innocent Palestinians as well as armed militants. In their intractable enmity, the two sides not only seemed bound to endlessly make war on one another but also to irreparably poison relations between Muslims and Jews throughout the world. Certainly, the toxin was already loose in the United States. The nation had just concluded a presidential campaign in which Jewish voters were implored to choose the Republican, Mitt Romney, who accused Barack Obama of having “thrown Israel under the bus.” While this strategy did not work, or at least not well enough for Romney to win, it compounded the divisive mood in the country. During Romney’s drive toward the GOP nomination, several of his challengers for the nomination outdid themselves trying to be the most anti-Muslim—one promising never to have a Muslim in his Cabinet, another flourishing the canard that Muslims want to install Shari’a religious law, a third claiming that the Muslim Brotherhood had insinuated itself into the State Department. Well before the 2012 election had even begun in earnest, a congressional committee had conducted hearings on supposed Muslim subversion. In all of these demagogic episodes, American Jews were being asked implicitly or explicitly to take sides against American Muslims. Yet on that same weekend before Thanksgiving, the members of a Jewish temple and Muslim mosque on Long Island came together to donate blankets, clothing, and food to the thousands of people uprooted by Hurricane Sandy. In Denver, Jewish and Muslim volunteers made a thousand peanut butter sandwiches to feed homeless and hungry people on the street. In suburban Detroit, young men, both Muslim and Jewish, played pickup basketball and then talked together about ways to improve the city. Just outside Washington, DC, Muslim and Jewish teenagers cleared debris and put down mulch in a park, then socialized over pizza. In the Bay Area of northern California, young professionals from Jewish and Muslim communities jointly discussed each religion’s teachings on business ethics. These collaborations, set vividly against the backdrop of the Middle East missiles and the rancorous presidential campaign, were part of a larger program of “twinning” that matched up Jewish and Muslim congregations—primarily within the United States but also from as far afield as Baku in Azerbaijan. And that congregational program arose from and attested to the extraordinary collaboration of two brave and bold men, Rabbi Marc Schneier and Imam Shamsi Ali. This book is the story of these men: their lives, their friendship, their commitment to coexistence work, and their vision of the future for Muslims and Jews in America and beyond. Sons of Abraham is a book of optimism, but not of naivete. Rabbi Schneier and Imam Ali are not what one might call the “usual suspects” of ecumenical efforts—clergy who are reliably liberal, if not congenitally touchy-feely, on all theological and political matters. Rabbi Schneier is entirely a product of Orthodox Jewry. Imam Ali studied Islam in a madrassa and university that largely followed the stringent Saudi Arabian model. Both men, for a period of their adult lives, uncritically accepted the biased view of Jews and Muslims as being innately, inherently enemies. Over time and with study and experience, however, both of these men grew, and eventually dared to challenge the conventional wisdom within their own religious communities. Against no small Amount of criticism from their own coreligionists, they forged their alliance. And Rabbi Schneier and Imam Ali did so in the bitter, frightened, polarized years after the September 11 attacks. Their credibility is built on what might be called, to borrow a term from sports such as diving and gymnastics, the degree of difficulty. The strength of their partnership also lies in their ability to disagree. Too often, interfaith dialogue operates under a well-intentioned kind of self-censorship in which controversial topics are avoided rather than engaged. No wonder so many otherwise laudable efforts can be so easily ridiculed as if they were folk songs being sung around the campfire. As this book demonstrates, Rabbi Schneier and Imam Ali trust their friendship and their common cause deeply enough to address any issue. They take on anti-Semitism in the Muslim world and bigotry against Muslims among Jews. They delve into sticky theological issues, like the idea of chosenness in Judaism and the concept of Kheir Ummah, or best nation, in Islam. They even address the third rail of Israel and Palestine, and find a respectful, civil rhetoric with which to contend and dispute. No one who knows of their work, and no one who learns of it from this book, can fail to be heartened. These are men of substance doing work of substance, taking significant risks against significant odds. I recall seeing them on the afternoon of September 9, 2011, two days before the tenth anniversary of the Al Qaeda terrorist attack on America. Hundreds of congregants were entering the Islamic Cultural Center, the largest mosque in Manhattan, for the Friday jummah service, the Muslim equivalent of Sabbath morning worship in a synagogue or Sunday Mass in a Catholic church. Beneath the center’s soaring dome, the congregants gathered, wearing Brett Favre jerseys or business suits or salwar kameez and covering their heads with crocheted skullcaps or Yankee caps turned backwards in hip-hop fashion. They had come to hear the weekly homily from their spiritual leader, Imam Ali. And they had come, too, to hear from the imam’s special guest, Rabbi Schneier. The tenth anniversary of 9/11 offered an especially vivid test of their alliance, and that was why they made a point of appearing together at the Islamic Cultural Center. There was no way to mark this day without squarely facing the damage it had done—not only the three thousand deaths, not only the destruction of iconic buildings, but the way it had desecrated the image of Islam and damaged relations between Muslims and non-Muslims in America. Uttering mere niceties, the bromides of brotherhood, would not suffice at this jummah service. Neither would the lamentations of victimhood. Then, after welcoming several visiting ministers, Imam Ali introduced “one of my best friends,” Rabbi Schneier. He called him “my brother.” “This guy,” Imam Ali said, “is there every time we have a challenge in front of us.” Members of the congregation lifted up their smartphones and digital cameras to take photographs of the rabbi. The book that Rabbi Schneier and Imam Ali have written offers eloquent evidence of that light. It tells us that human beings can grow beyond their prejudices. It tells us friendship and collaboration can survive civil disagreement. It tells us what has been done, and it tells us, most importantly, what those of us who care about the inevitably, inextricably shared future of American Muslims and American Jews still must do. Love Thy Neighbor or Love the Stranger?